Ontdek's Kenya family safaris are designed to put depth in every day of your family's vacation. From our own experience of traveling with our young children, we connect with the interests of every person in your family. Your tour has: excellent wildlife viewing, guided game viewing walks - so that your days are not spent cooped up in a safari bus (a vehicle remains with you for those who may opt for a drive), comfortable accommodations (no camping), Ontdek's renown ground logistics and competent naturalist guides. Read this when you're planning a family safari in Kenya. This is a very relaxed 11 days Kenya family safari with two bases in the Rift Valley - each with 3 nights and ends with 3 nights in Masai Mara. Of importance is that it is off the high-tourism circuit and it has minimal road transfers. You may opt for internal flights from Mara to Nairobi. 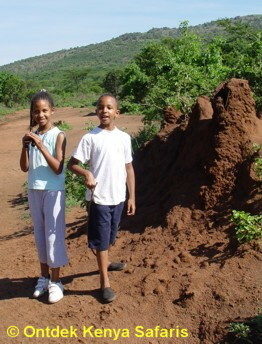 We offer you stress free family travel that is a genuine alternative to the package safaris. We can also customize our Kenya family safaris to suit your specific needs, please contact Ontdek Kenya Safaris. Arrival at the airport at night and reception by Ontdek Kenya. Transfer from the airport to the Nairobi Safari Club or equivalent hotel in Nairobi. Situated on the shores of Lake Elementaita, the Sunbird Lodge is a place for those seeking a one-of-a kind secluded place away from mass tourism. Breathtaking scenery, great food, staff that has just the right mix- professional and yet personal and with 10 cottages that break all possible standards on decor and comfort – this is the ideal place for a family with children and young adults. Staying in Sunbird just for the view would be well justified but the place is filled with inviting activities for the whole family. For the 3 days here you have options for soft walks along the shores of Lake Elementaita which is colored pink with flamingos, bird watching, day game drive in the nearby Lake Nakuru national park and also the nearby Soysambu Conservancy. Get a birds view of the whole region by taking a balloon safari – operated by the owners of Sunbird who are balloon pilots. Your stay in Sunbird is structured with flexibility in mind- you won't be tied down to a near-military safari schedule. As all the activity sites are close by, you will discuss with your safari guide how you want to schedule things. Your family safari transfers now to the Lake Naivasha area for the next 3 three days. Your hotel is situated on the lake shores and has green lawns shaded by mature acacias and spreading fever trees that stretch down to the lake's shore. 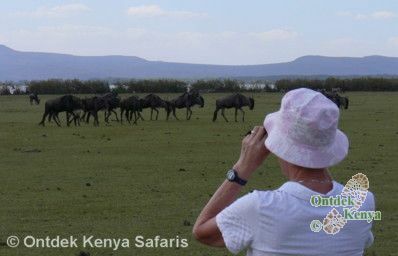 In the afternoon you do a game viewing walk at the privately owned Crescent Island, which is a peninsula on the Eastern shore of Lake Naivasha. There is a lot of easy to see game e.g. giraffes, waterbucks, elands, zebras and impalas. It is also a heaven for Kenya birds with +200 species recorded. The walk is gentle and satisfying. We return to the Lake Naivasha Country Club in time for afternoon tea. After breakfast we do a short transfer to Hell's Gate National Park. This is a unique park where walking is done in the middle of wildlife. Giraffes, zebras, warthogs and many types of gazelles are found here. With a vehicle on stand by throughout the day, you have the option to hop in the vehicle should you feel you want to make the walk short. Hell's Gate is a flat African savanna in a volcanic area with huge rock boundaries. There are camphor and acacia trees all over and this is where to look for the giraffe as they mainly feed on them. An early rising will ensure that one gets another magical display of the various birds. After breakfast we do a transfer by bus to the nearby Crater Lake Game Sanctuary. It is a lesser lake in the Rift Valley but a place where nature is at its best. Again with option of walk or vehicle game drive this is the place to see giraffes, black and white Colobus monkeys, elands and a range of gazelles. We now take a break from walking to put all our attention to watching wildlife. To see the best of Kenyan wildlife, Masai Mara is the place to be. Elephants, rhinos, giraffes, buffaloes, gazelles and all the big cats are found here. So, after breakfast we start our journey passing through Narok Town; a colorful Masai town. Our game viewing does not actually start at the park gate. We will be able to see many animals along the way grazing side by side with the Masai livestock. We reach the tented safari camp, our home for the next three days, in time for lunch. On your 3 days here you may opt to break from the vehicle game drives and take a soft walk guided by Morans. A visit to a Masai Village will be of particular interest to the children. Return to Nairobi either by road or by a domestic flight. Evening transfer to the airport where we say goodbye. Itinerary changes on your Kenya family safari may be made due to local conditions beyond our control. PRICE: Our attractive price based on the members of your family includes all accommodation as per itinerary, all meals from breakfast of day 2 through lunch of day 11, all transport Nairobi-Nairobi and airport transfers, bottled water during the walks, services of guides, the park entrance fees and a Flying Doctors Evacuation cover. The only extras on you are spendings on airfare to Kenya, airport taxes, visa, insurance, drinks, tips and expenditure of personal nature. For a consultation on family safaris Kenya, contact Ontdek Kenya safaris. We have over 20 years of experience in travel with children in Kenya.